Born into a sharecropping family in New Hebron, Mississippi, in 1930, and only receiving a third-grade education, John M. Perkins has been a pioneering prophetic African American voice for reconciliation and social justice to America’s white evangelical churches. Often an unwelcome voice and always a passionate, provocative clarion, Perkins persisted for forty years in bringing about the formation of the Christian Community Development Association—a large network of evangelical churches and community organizations working in America’s poorest communities—and inspired the emerging generation of young evangelicals concerned with releasing the Church from its cultural captivity and oppressive materialism. John M. Perkins has received surprisingly little attention from historians of modern American religious history and theologians. 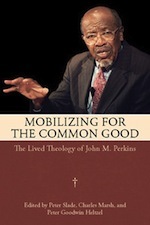 Mobilizing for the Common Good is an exploration of the theological significance of John M. Perkins. With contributions from theologians, historians, and activists, this book contends that Perkins ushered in a paradigm shift in twentieth-century evangelical theology that continues to influence Christian community development projects and social justice activists today. Peter Slade, Ashland, Ohio, is an associate professor of religion at Ashland University. He is the author of Open Friendship in a Closed Society: Mission Mississippi and a Theology of Friendship. Charles Marsh, Charlottesville, Virginia, is a professor of religious studies and the director of the Project on Lived Theology at the University of Virginia. He is the author of multiple titles including Reclaiming Dietrich Bonheoffer: The Promise of His Theology. Peter Goodwin Heltzel, New York, New York, is associate professor of theology and the director of the Micah Institute at New York Theological Seminary and an ordained minister in the Christian Church (Disciples of Christ). He is the author of Jesus and Justice: Evangelicals, Race, and American Politics and Resurrection City: A Theology of Improvisation. Civil Rights, Community Organizing, Faith Communities, Peacebuilding, The American South, Why Lived Theology?